In Enterprise Applications there are many use-cases where you have to provide informations instantly to users. If the user is on a mobile device, you can use Push Services provided by Apple, Google, Microsoft or RIM. I’ll blog about Push Services for mobile users in another blog about enMOcs (enterprise – mobile – communication server using Eclipse RT technologies). and also an Admin – Web UI. This blog is about the latter: a Web UI and because the enMOcs server is built on top of OSGi, the Web UI should also be a good member. The next good thing about Vaadin: all the uncount Add-ons enabling you to build great looking Applications – and most of them are Open Source licensed. Vaadin also provides an Eclipse PlugIn, so I can use my beloved IDE. I’m not a classical Web developer, so I don’t like to develop war’s, web.xml, … – I prefer to use OSGi HTTP-Services instead. Fortunately I’m not alone and Chris Brind, Neil Bartlett and Peter Kriens did some work on this and Kai made an easy-to-use Demo Application. and Florian blogged about the technical details. redVaadins Push demo is based on Kai’s Vaadin – OSGI Demo. enMOcs can also push to running Riena-redView RCP – Apps or itself using mobile Push Services and push to Admin’s mobile Device. The use-case above is only one of many scenarios – more will be described in detail later. BTW: enMOcs will support Push Services x-platform (Apple, Google, Microsoft, RIM). 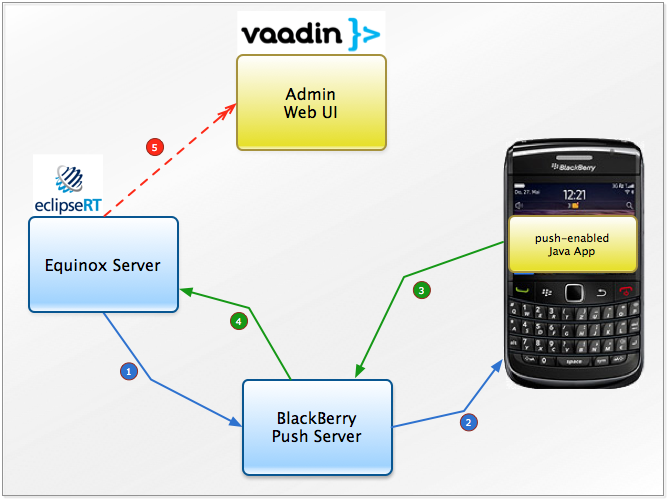 read more about redVaadin Push Services using ICEpush at Florian’s Blog here, download the examples, read the HowTo’s and play around with it. we’re waiting for your feedback to make it better. Push demo Projects include Sources, so you can take a look behind the scenes. Source repository will be public end of may 2011.